Proposed in this paper is design and analysis of an enhanced recycling folded cascode (RFC) Op-Amp. This structure is achieved using connecting two nodes and eliminating some devices in the conventional RFC. This effect enhances the DC gain with increasing output resistance of differential pair compared to the conventional RFC circuit. In the same − 3 dB frequency, the unity gain bandwidth is also increased. Moreover, for the same slew rate and input referred noise performance, other proposed improvements are the fast-settling time and total harmonic distortion. 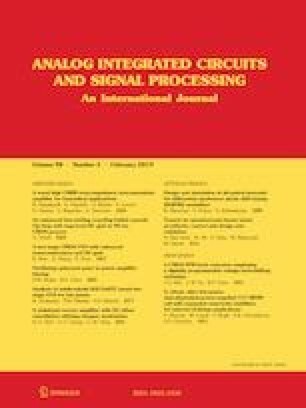 Hspice simulation results in 90 nm CMOS standard technology demonstrate that the proposed amplifier has 1.2 times the unity gain bandwidth (190 vs. 160 MHz) and also has twice gain boosting (66.2 vs. 59.5 dB) in the same − 3 dB frequency, power supply (1.2 V) and driving capacitor load of 5 pF. The authors would like to thank all people involved in this research work for their kind and responsible assistance special to Dr. Mahdi Mottaghi and Prof. Kh. Hadidi. Dadashi, A., Alizadeh, B. (2011). An enhanced folded cascode op-amp in 0.18 µm CMOS process with 67 dB dc-gain. In IEEE conference publications of faible tension faible consommation (FTFC) (pp. 87 –90). https://doi.org/10.1109/ftfc.2011.5948926.